Admittedly, I was a little hard on Emmylou Harris & Rodney Crowell's last album, Old Yellow Moon two years ago. Individually, I like both artists a lot and expected greater things from that disk. At best Old Yellow Moon was fine, but mostly it missed the mark. As a member of Harris' Hot Band years back and an accomplished producer in his own right, I figured Crowell would step-up and take the helm of the last album.....or even this one. He did neither on both. The Traveling Kind is remarkably better than their last outing. Maybe it's the song choices. Maybe it is that Crowell wrote more of these. Maybe it's because Harris wrote some too. Perhaps it is Joe Henry's production. Perhaps that there is a more 'country' bent to this than 'americana', the latter in which both have made great strides in the last few years - but early on, they were full-on country (not that they'd actually be allowed in today's sub-par version of country music). With the opening of title track, Harris gives a nod to her mentor, Gram Parsons with "we don't all die young to save our spark" and then references both of her and Parsons (waycross boy & the red dirt girl). It's a nice song and nice harmonies between her and Crowell. A really different kind of tune - which I wasn't sure I'd like, but really do - "Bring it On Home to Memphis". The song structure is different for both artists, but it works. I'm not sure I can say the same thing about "No Memories Hanging Round". Harris isn't in the best voice for this - and I think Crowell produced the ultimate version when his then-wife Rosanne Cash recorded it back in 1978. Their cover of Lucinda Williams' "I Just Wanted to See You So Bad" is pretty frickin' good. Harris has always had a good track record at recording Williams. The rest of the songs work on some levels - and some more than others. 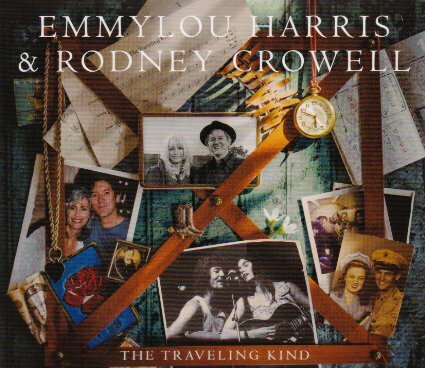 It could be argued that Crowell and Harris don't harmonize traditionally well - and that might be true, but their love of the music and each other's styles can transcend that. Sure - it can be an acquired taste, but I don't think anyone would dispute the talent they have together or one their own.